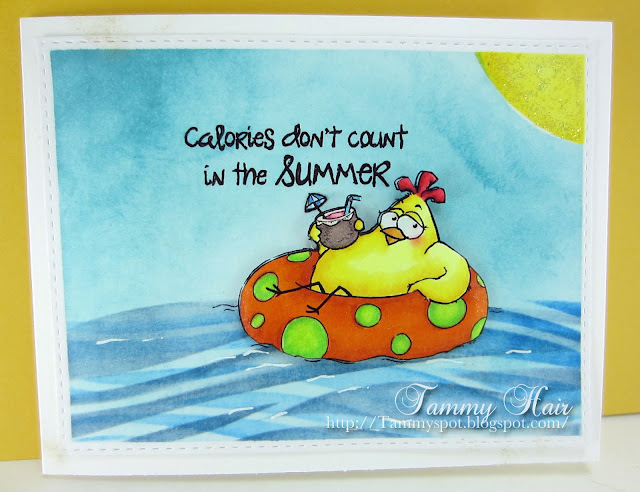 Tammy's Spot: Calories Don't Count in the Summer! I'm so glad I get to play along in From the Heart's Digital Stamp of the Month Challenge for July since I participated in June! This month's super fun image is Inter Tube Birdbrain along with several fun sentiments! I sure hope there are no sharks in the water! Hahaha! So cute! Great colors. Just fun! Fabulous card Tammy. I love the fun image and sentiment, brilliant colouring too! Fabulous card Tammy..love the blue ocean and brilliant colouring..such a fun scene..
Sweet image and great background, Tammy. Don't I just wish that sentiment was true! Good to know! I love this sensationally delightful creation, Tammy! LOVE!!! The waves looks so inviting - as long as there isn't a shark lurking around. Cute, cute card Tammy! FUN Card, Tammy ! Great coloring, the sea/waves looks very real. Thanks for joining our FREE Stamp of the Month July Challenge @ From the Heart Stamps !! Oh Tammy.........if only......lol! I love your sweet little card! Fabulous card and I love how you created the water. Love the bright colors. My feelings exactly! Cute image. I love your water. I hope your summer is going well!